I stayed for the week with Helen and we decided to revisit Crogen. This artificial lake alongside the river was probably originally created as a duck shoot but is now very overgrown, with not much water to be seen. It was the first site I ever visited with my predecessor, Peter Benoit in 1999, so it was one of the few tetrads in the Vice-county which had more records before- than post-2000. We walked across the improved fields and around the lake where we recorded a suite of aquatic plants such as Alisma plantago-aquatica, Water plantain, Carex rostrata, Bottle Sedge, C vesicaria, Bladder Sedge and their hybrid C x involuta [determined by Mike Porter]. Comarum palustre, Marsh Cinquefoil is always good to see, as were Sparganium erectum, Branched Bur-reed, Carex acuta, Slender Tufted-sedge Typha latifolia, Bulrush and Scutellaria galericulata, Skullcap. We recorded both Stachys palustris and Stachys x ambigua, the hybrid with S sylvatica, but in hindsight I wonder if they were not both the hybrid. 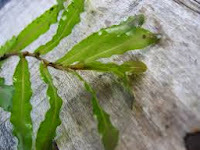 Some people think that if a plant has any odour it cannot be S. palustris. My own feeling is that it also has some smell, though not an unpleasant one. It is a very subjective sense, smell! The next day was a Merioneth Nats meeting at Llyn Oror, north of Corwen. 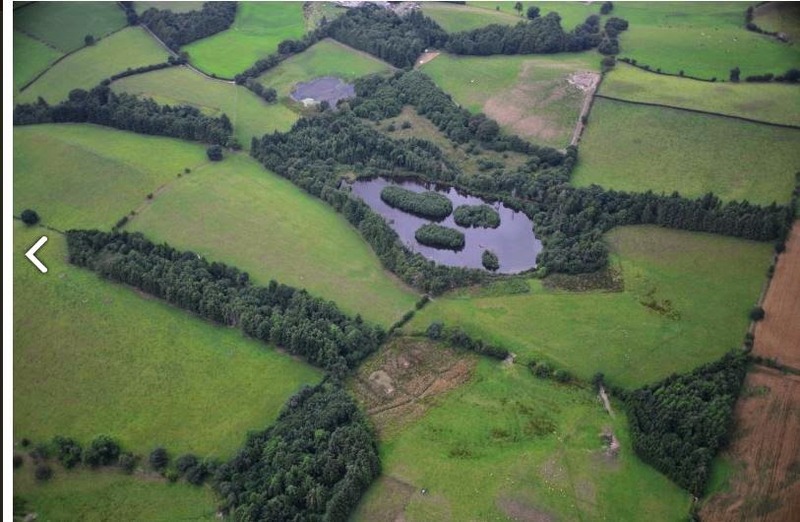 It’s a strange area of heavily improved farmland surrounding two fishing lakes. The smaller of the two had apparently been planted and was full of the bright yellow flowers of Fringed Water-lily, Nymphoides peltata while around it was a stand of a variegated Glyceria maxima, Reed Sweet-grass. We enjoyed our picnic in bright sunshine on the shore. The main lake by contrast, is very overgrown with scrub almost continuously surrounding it. However unpromising this dank lake looked, we were rewarded by finding the first record ofPotamogeton crispus, Curled Pondweed, for the county. 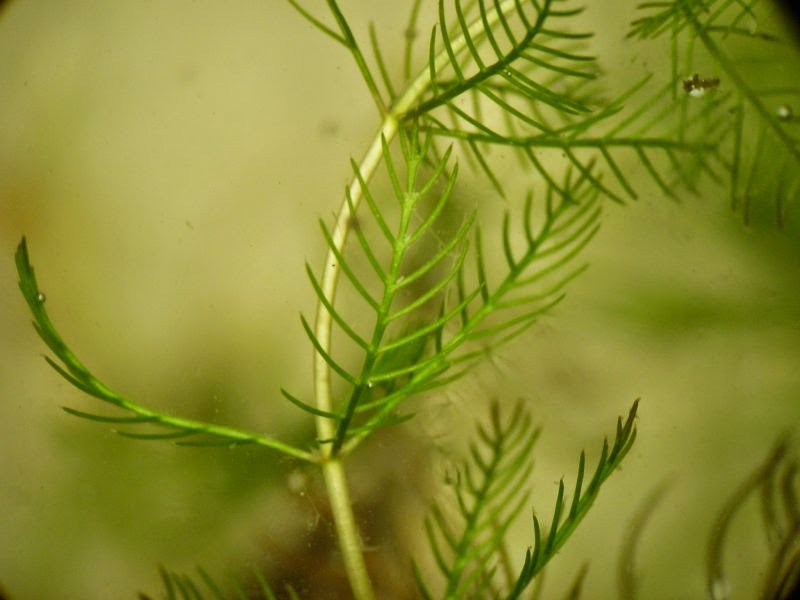 as well as an update for the Rare Plant Register, Myriophyllum spicatum, Spiked Water-milfoil. These good records apart, the day was memorable for Jacky losing, and then through dogged persistence, refinding her notebook in the featureless scrub surrounding the lake! Our grateful thanks for access permissions as ever, to the landowner, David Duffell.